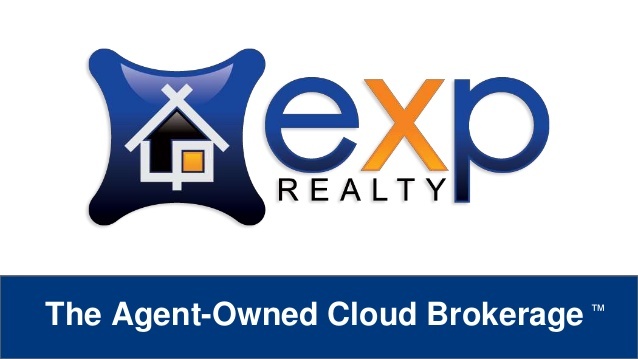 eXp Realty IS the first-ever and ONLY “Agent-Owned Cloud Brokerage” in the industry and is also one of the fastest growing real estate brokerages in the United States. The traditional 100-year-old brokerage model may no longer be a sustainable model in today’s ever-changing mobile real estate market. 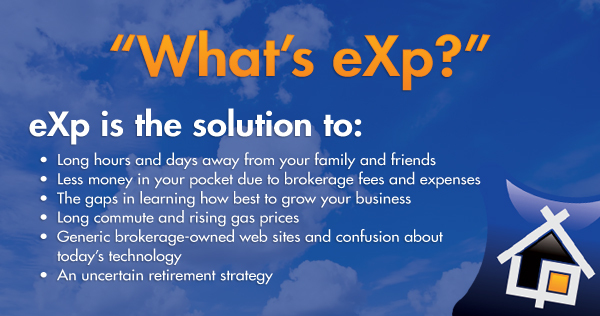 At eXp Realty, our family of agents and brokers build and own their own businesses. They work, attend classes, strategize, collaborate, innovate, enjoy water-cooler chats, build teams, build unity and share experiences on our interactive, outdoor, avatar-based Cloud Campus. Education and on-going training is the key to a successful career in any industry. Together, we’re leveraging systems, tools and some of the greatest people in the industry in order to grow an agent and broker-owned international, publicly-traded company. 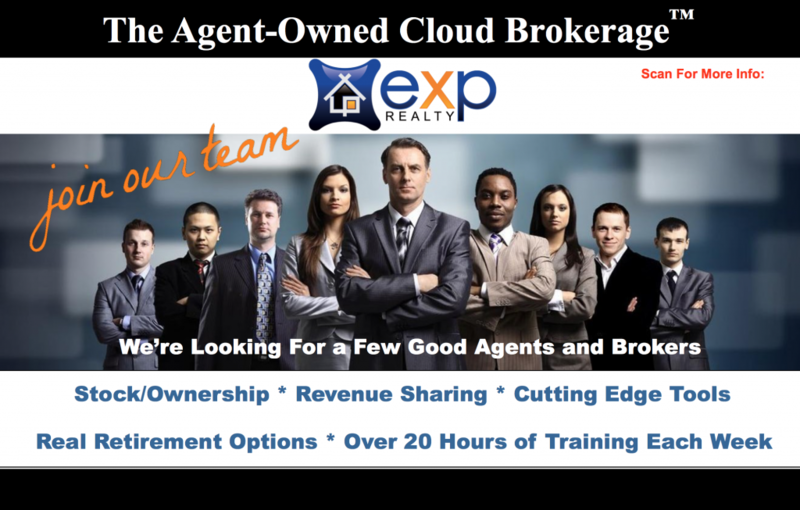 eXp Realty agents and brokers are working together to build businesses, build and enhance brands, increase profitability, reduce overhead and risk, and achieve bold career and life goals. This is all possible due to the re-evaluation and implementation of a new model. 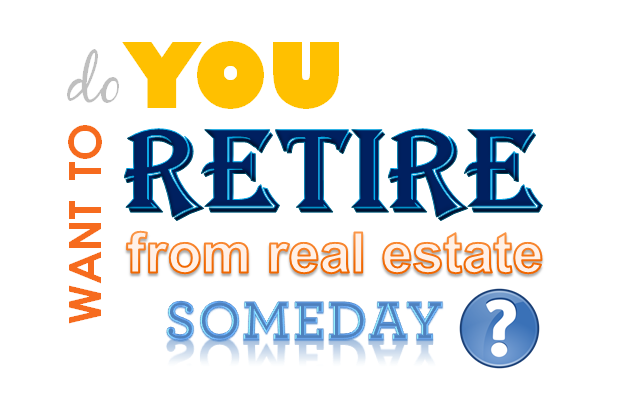 We are actively seeking entrepreneurial, forward-thinking, Licensed Real Estate Agents. 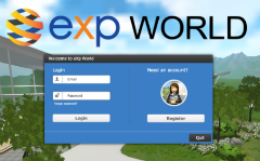 eXp Realty provides the systems, support and community that, in combination, provide opportunities for ownership, income and professional development not found elsewhere in the industry. 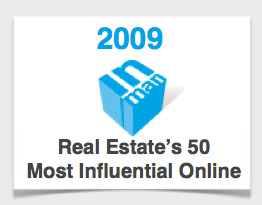 A unique and life changing opportunity for real estate professionals. Must be a licensed real estate agent and in good standing with the local Realtor board. 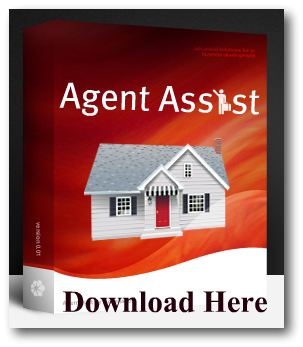 You do not need to be a tech-savvy agent to join us. You just need a willingness to embrace and learn new technologies and tools in order to take your business to the next level and succeed in a competitive and rapidly-evolving industry. Consistent flow of new leads through our Making it Rain program – we run the lead campaigns on your behalf. No more high-priced subscription agreements with third-party syndicators. Never Have Regrets – Always Wonder What-if? You owe it to yourself to research and do the due diligence required to determine if this is the right fit and match for you? Simply making a lateral move just for the change would not be suggested, however if after researching and comparing your current business and financial model you decide there is a significant difference and value, then simply apply. 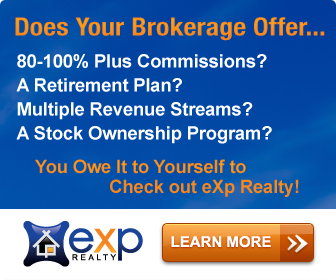 OWN your career, OWN your brand, OWN your brokerage, OWN your life! 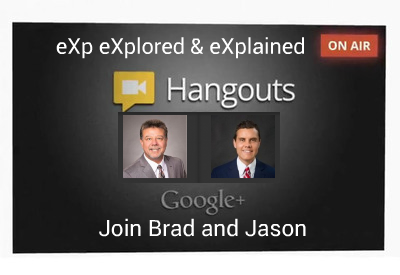 Apply today to start a completely confidential conversation about becoming an owner with eXp Realty. It’s Your Career – Own It!